Email marketing is personal and customizable – It’s easy for a company to customize their content to fit the needs of their leads. This is because we can track the actions of the leads throughout a company’s website in order to help make content more personal. For example, if a lead has visited a company’s e-commerce page multiple times without making a purchase, we can target that lead with content that provides helpful information about the company’s products or services, or we can even send them special promotional content. We allow companies to segment their email lists in order to target their leads more effectively, thereby sending more personal emails that help build a stronger relationship with the consumer. Email marketing is a great way to build relationships – In addition to being able to tailor content more effectively to a company’s email list, email marketing allows companies to communicate directly with leads, prospects and current customers whenever it is convenient for them to do so. In fact, companies should encourage consumers on their email list to contact them whenever they have questions or comments in order to continue to build trust and loyalty. Email marketing is an affordable strategy – While it’s not exactly cheap, email marketing does provide a high ROI according to many studies. One particular study showed that email marketing provided an average ROI of 28 percent. This is pretty high compare direct mail, an older outbound marketing strategy, which has an average ROI of around 7 percent. Email marketing is immediate – Consumers want access to immediate information and regular updates. Other marketing strategies, such as TV commercials or billboard marketing, are too slow. Email marketing provides instant updates to consumers since consumers have easy and instant access to their email accounts in this day and age. Email marketing promotes action – Once a consumer opens and reads an email, they will be incited to act, whether it’s to reply to the email, click on a link, sign up for one of the company’s services or to purchase a product. 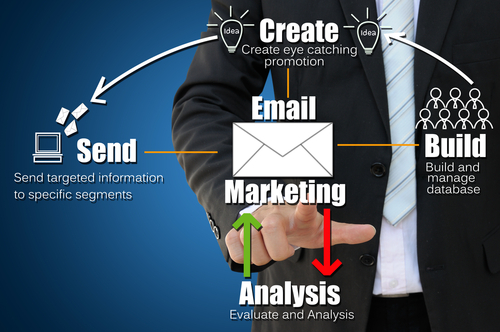 Email marketing can be used to drive traffic to the company’s website and to eventually purchase products or services. Email marketing is measurable – One of the most beneficial aspects of email marketing is that we can use analytics in order to measure how a company’s email marketing campaign is fairing. Some of the analytics that we will use include delivery rates, click through rates, bounce rates, open rates, unsubscribe rates and more. These metrics help to provide an overall picture of how an individual email marketing campaign is doing, and more important, allows us to adjust a company’s email marketing strategy on the fly to ensure its success. Email marketing provides better access to consumers – Almost everybody uses email. In fact, email is one of the most used applications on desktops and mobile devices, including smartphones and tablets. According to an IDC study, 78 percent of people aged 18 to 44 use their mobile devices for email compared to 73 percent that use them for the web. With the fact that there’s Internet access worldwide and that mobile penetration is incredibly high and only growing, email marketing provides companies with a global reach. Email marketing is a strategy that we cannot recommend enough for the stated reasons. Here at Britewave Digital, we will employ a number of effective email marketing strategies in order to create a successful email marketing campaign for our clients. Additionally, we will make sure their email marketing strategy is integrated with the rest of their online marketing strategy, from social media marketing to content marketing. For more information about our email marketing services or our online marketing services in general, contact us at Britewave Digital today.